Today is finally here, the day to put your wish lists into action and start the buying process and I sure do hope you have a fun time doing so..
We are back again today along with some friends of MFT to share more inspiration for you using the January Release.. I chose to use Rainbows and Unicorns, stamping out the sweet little images and colouring with Copics, die cutting out and setting aside..
Next, I worked on the background piece of the card front, by using some Post-it tape, I taped off the edges of the card stock and using the Mini Cloud Stencil along with Blue Breeze ink, I added a cloud feature.. Onto more die cutting, I took a Stitched Heart Stax and die cut out of white card stock, adding this to the front of the card panel.. 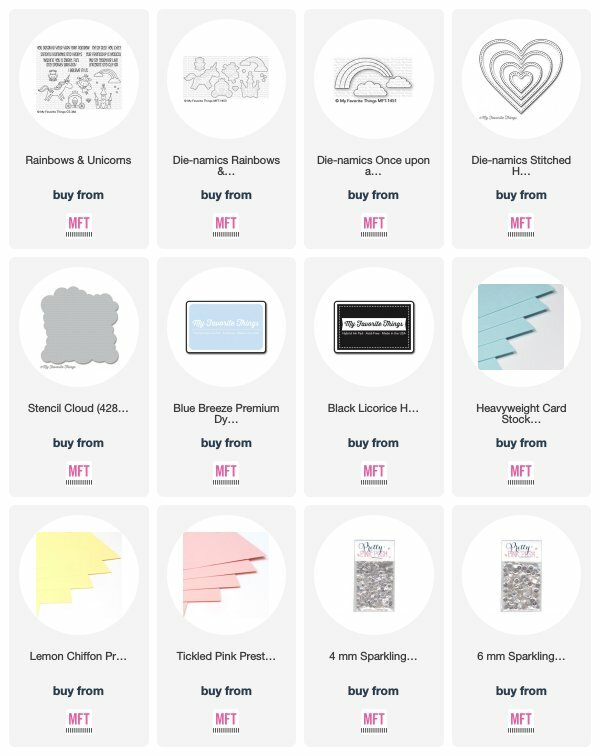 I then took Sno Cone, Lemon Chiffon and Tickled Pink card stocks and ran them through using the Once Upon a Rainbow, for the clouds I die cut white.. I added these to the heart then added my little coloured images, I completed this card by adding a scattering of sequins and a sentiment at the base..
Be sure to head over to the blog to see who is joining us this month and the inspiration from the Team..
Have a fantastic day and happy shopping..